View Poll Results: WHO will WIN IPL 2017 TROPHY ? Ishanth Sharma, Kyle Abbott, Trent Boult, Chris Jordan - Not so wise decisions. Pace bowlers are prone to injuries and you need good reserves. Unlike earlier years when England players were not available in large numbers at the lucrative IPL auction, the scenario will be different this time feels limited overs captain Eoin Morgan. Asked if he is looking forward to the auction, pat came the reply: "Yes, I do and a lot of them will be available for the auction this year. Hopefully,they will be picked up and playing the majority of the games. That's the best case scenario." Morgan like Jos Buttler believes that IPL is a platform that can help the English players grow and the ones like him who have played for long should help out. "It's with our skill level. The belief is there, character is there, talent is there - it's reproducing your skill level. As I mentioned, India are a tough side to beat at home. You need to have skill level. The guys playing the IPL I believe will set them up." Morgan wants to look at the positives despite his team's series defeat against India as the Champions Trophy will be played at home in five months time. England batsman Joe Root will not be available to play in the lucrative Indian Premier League (IPL) this year as he is eager to spend time at home with his newborn son, the 26-year-old has said. One of the most sought-after batsmen of his era, Root has been reportedly been contacted by several franchises of the Twenty20 league beginning on April 5. "It is a shame because there is a really good window in the international calendar to play. But looking at the schedule, especially next winter, I am going to be away for long periods," Root told British media. "This will be a great opportunity to spend time at home and watch (son) Alfred grow up a little bit. A lot of great things would come from the IPL, a lot of great experiences and I am sure it would help to improve my game. "But at the moment being at home is my priority and I want to make sure I do not miss out on that. It is quite tough being away in these early days so it will be nice to catch up." IPL 2017: Kohli, De Villiers, Starc, Gayle and....Ben Stokes for RCB? When Shane Watson was added to an RCB team that already had Virat Kohli, AB De Villiers, Chris Gayle and Mitchell Starc, albeit an injured one, during the IPL 2016 Player Auction, you felt it was unfair â€“ no one team can surely be so ridiculously power-packed. So, how would this desperate-to-win-their-first-IPL-title Royal Challengers Bangalore team look if they bought one of the most explosive all-rounders in the game today during the IPL 2017 auction? Ben Stokes has already confirmed he will take part in the upcoming season of the IPL, provided somebody buys him during the Player Auction, set to be held in Bengaluru on February 4. While English players are always looked at with a bit of suspicion by the franchises, mainly due to their availability issues, nobody will want to pass up Stokes, even if the Englishman might not be able to play the entire season. Stokes, right now, is the best pace bowling all-rounder out there, with his ability to win games with both bat and ball a skill that will have all eight IPL franchises drooling for his signature. The Englishman showed his true all-round worth during the third one-day international against India, first striking a brilliant 39-ball 57 to give England the extra runs they needed to prevent the home team from chasing down the total, before taking three wickets in the second innings. RCB going to raise that paddle? So, when Stokes comes up under the auction block and his name is read out by Richard Madley, will RCB be one of the teams to show an interest? That is a really good question to ask, because to have Stokes play in a team which will have Kohli, De Villiers, Gayle and Watson, will be like one of those fantasy squads. The problem, though, lies in the fact that RCB already have their fast bowling all-rounder in Watson, who was fantastic for the Bengaluru franchise last season. Watson might not be an international cricketer anymore, but his ability to bowl brilliant spells during the death overs, take crucial wickets in the innings and whack a few when required with the bat is a precious resource to have. Stokes does the same thing as well â€“ whether he will do it better than Watson or not in the IPL only time will tell â€“ so to have two similar players, and crucially, overseas players, will be too much of a luxury for RCB to have. Indeed, there were times last season, when even Gayle, the great West Indian marauder, struggled to get into the RCB playing XI. The Royal Challengers Bangalore, however, are known for luxury â€“ hey, they have Kohli, De Villiers, Gayle and Starc in the same team â€“ so you wouldn't be entirely surprised if that paddle gets raised when Stokes is up for auction. You also feel, Kohli would have put in a good word for Stokes, knowing just how dynamic a player he is. While the two might not have seen eye to eye during this long India vs England tour, there is little doubt that there is tremendous mutual respect there, and Kohli would love to take that mutual respect and turn it into some teammate love. Unlikely, though, it might be, considering the resources already at RCB's disposal â€“ some other franchise is likely to bid higher as well â€“ there is no harm in dreaming of a team that has Kohli, De Villiers, Gayle, Starc, Watson and Stokes. You might only be able to play four overseas players, but boy that would be as close to an unbeatable team as you can get. New Delhi: Rising Pune Supergiants (RPS) has acquired the services of Delhi Daredevils' batsman Mayank Agarwal for the upcoming Indian Premier League to be held later this year. Mayank turned out to be the first trade of the season in the second trading window of IPL 2017, which was open from January 13 to 20, a BCCI release stated. The IPL 2017 will be played from Wednesday, April 5 to Sunday, May 21. Indian Premier League season (IPL 10) is three months away to start but buzz among the fans on IPL auction 2017 is started which will take place in a few days. IPL players auction is special and important part of the worldâ€™s most popular T20 league. Cricket fans love to hear Richard Madleyâ€™s British accent during the auction who is doing it for last nine seasons and it is expected for the 10th season too. The cricket players from all over the world took part in this auction and teams franchises bid huge amount of money on these players. The IPL 2017 playersâ€™ auction will be the final edition under the existing 10-year contract. The auction to be held in Bengaluru on 4th February 2017. In the IPL governing council meeting, it was also decided that defending champions Sunrisers Hyderabad will host the opening ceremony and the final of the IPL 2017. 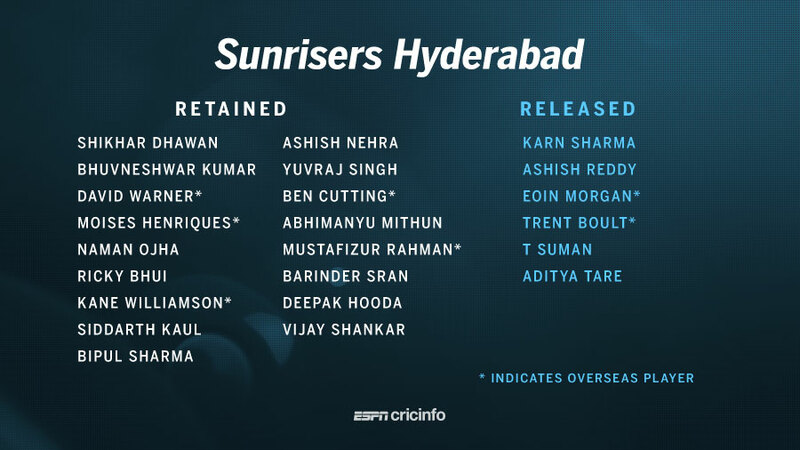 Many IPL franchises have released their big star players from their squad including Pieterson, Dale Steyn, Morne Morkel, Eoin Morgan, and Jason Holder. The teams who will take part in the IPL auction 2017 are Delhi Daredevils, Kings XI Punjab, Kolkata Knight Riders, Mumbai Indians, Royal Challengers Bangalore, Sunrisers Hyderabad, Rising Pune Supergiants and Gujarat Lions. This year teams owner will like to do some experiments with the players because after this season all players will be once again included in auction pool for IPL 11. This is the 10th edition of Indian Premier League and bidders will get many new players to include in a team. IPL is expected to start on 4th April and ends in May and auction will take place on 4th February for this seasons in Bengaluru but the venue is yet to decide. The time, venue and list of players to go under the hammer in the IPL auction will be announced by IPL governing body soon and we will update it here. As many as 140 cricketers including 44 overseas players have been retained by the VIVO IPL franchises for 2017 season. In the last yearâ€™s IPL auction, total 351 players were available for the bid but the majority of them went unsold. Below is the result of IPL 9 auction. Out of 351 players, 130 players are capped, 219 players are uncapped and two cricketers are from associate players quota (Canada and Ireland) are set to go under the hammer in the IPL 2016 auction. A maximum of 116 players can be chosen at the auction. Here is the list of players set their base prices themselves.